As far as celebrated Christmas trees go, Claridge’s annual unveiling is guaranteed to cause a collective gasp from guests and visitors alike. In the case of this year’s goofy woodland scene by Dolce & Gabbana, it will melt even the most hardened of ‘bah humbug’ hearts. Fashion designers, it seems, have a knack for producing fantastical tree creations at Claridge’s and both John Galliano and Lanvin’s Alber Elbaz have all done a spectacular job in the past. This is of course one fashionable hotel with plenty of fashion history. It is a home-from-home to many a designer from Diane Von Furstenberg to Marc Jacobs. Furstenberg has even designed suites here while Jacobs has also left his mark on various corners of the hotel. To design a tree however, Claridge’s only requisite is that you are a lifelong friend and guest. Take John Galliano for instance, the then creative director at Dior. During a stay at the hotel in 2009, he was asked if he would like to design ‘something different’ for the Art Deco hallway beneath the staircase. Up until then, a traditional spruce had stood, festooned with classic decorations and gift-wrapped parcels. “When the first drawing came in from Dior’s office with John’s vision for a frozen, tropical tree complete with snakes and leopards we realised that we had entered into a whole new world with our trees,” says Paula Fitzherbert, group director of communications. Luckily for Galliano, Claridge’s forward-thinking general manager thought it was a wonderful idea and gave Galliano free creative reign. More art installation than Christmas spruce, the sculptural trunk was lit as if it were covered in ice. Reflections of serpents and leopards danced eerily on the ceiling. It was so successful the designer was asked produce another tree the following year. As Fitzherbert notes: “This is the luxury world and you have to keep upping your game with even more elaborate designs year after year.” Galliano’s follow-up design for Christmas 2010 entitled ‘Under the Sea’ with its shimmering silver leaves and wisps of pink coral certainly didn’t disappoint. By now, novel trees were becoming a Claridge’s tradition, as are the glamorous launch parties, which accompany them. Each tree takes six months in the planning and is put up overnight at the end of November, while guests are sleeping. The last bauble has to be on by 6am. In 2011 Alber Elbaz was asked to work a bit of Lanvin magic on a tree, which he did with typical tongue-in-cheek humour. His theatrical production featured handmade silk figurines of himself as a treetop fairy, as well as other fictional characters including Mr and Mrs Lanvin, their maid and Mr Lanvin’s mistress, all seated together on a sofa. A year later, Stefano and Domenico brought a touch of Sicilian Christmas to the foot of the famous staircase. Their tree was adorned with handcrafted Sicilian puppets known as ‘pupi’ as well as festive Italian glass baubles and snow sprinkled on top. The creative duo are said to have enjoyed the experience so much that they asked if they could do it again, which brings us to Christmas 2014. Inspired by children of the world, branches are decorated with baubles and flags, while at its base toy deer and squirrels nod their mechanical heads. My nine-month old niece wanted to eat them but other, older children admired the Christmassy scene without feeling the need to chew anything soft. Finally, a trip to see the tree wouldn’t be complete without Christmas tea in the tearoom and a round of carols from local choirboys and girls. And for guests who are lucky enough to be staying here on Christmas Eve and Christmas Day, there are organised horse drawn carriage rides around Mayfair. Customary hot chocolate and mince pies are also served on Christmas morning, which makes me dream of finding myself a room at the inn. On the eve of his first major London retrospective at Phillips, the international auction house’s new Berkeley Square HQ, New York artist and filmmaker Andrew Levitas talks life, death and losing his bearings around town. So Phillips approached me and asked if I would be the first solo artist to exhibit at its incredible new space. The show is more of a mini retrospective, starting with my flat panel metalwork photography. This is essentially a hybrid style fusing sculpture and photography on sheet metal to produce a beautiful reflective surface – and the exhibition is really an exploration of how it has developed over the last two decades. The process is incredibly intricate but also fun and let’s me be a kid every day. What could be better than that! I think it’s unfortunate that we live in a world where we are so often asked to assign meaning to things and have that be the only meaning. The truth is, everything I create, whether a sculpture, a film or a photograph, always has my specific idea and reason for doing it. But that’s not necessarily what anyone else should see when they view it. For me, it’s really important that people have an emotional response to each piece I make. Take ‘iTree’ for example. This three-dimensional geometric tree is made from a square, a rectangle, a circle and a triangle and plays with the notion that human beings are always trying to understand things and make them better. It works on a number of different levels. Firstly, I wanted to create a tree that was better than nature, which of course is impossible, but ultimately I wanted it to say that if we’re not careful, this is the sort of thing you will see in parks and gardens in future. These days I split my time between London, New York and LA. London is a remarkable city. It has such a great art community and so much work is shown here. I’m a fan of everybody, though Anselm Kiefer is probably my favourite artist. There’s a spectacular show currently on at the Royal Academy. When I’m in London I do the exact same things as I would in New York; walk, see as much theatre as possible, visit museums and galleries. The only tricky thing with London is that I find it very hard to know where the heck I am! I’m always lost and spend a lot of time staring at Google Maps on my iPhone as I walk along. Manhattan is a lot more straightforward. I’m always looking for imagery where people look at the same image in different ways. Take ‘Miss Predestinate 2014’ for example. This aluminium sculpture is extremely feminine thanks to its soft egg-shape and pale pink colouring. But look closer and you see it features photographs of skulls – Capuchin monks’s skulls. I took the photos in a crypt in Rome. It is one of the holier places where priests and popes have walked, and in many ways could be viewed as a gateway to the eternal. So for some, skulls represent life, even though I personally associate them with death. The same imagery appears on ‘Panspermia 2014’, a comet-shaped 3D sculpture, which is really a metaphor for where life may come from and where life may end. The inky midnight blue colour naturally occurred when I was taking the photos. You have to know what you want and be specific in your choices and ideas but the best work always comes out of happy accidents! George Graham is CEO of the Wolf & Badger store on Dover Street, which he co-owns with his brother Henry. When he is not sniffing out unique and signature pieces from independent designers and brands he can be found admiring the beauty behind many a Bond Street facade. Meanwhile no morning is complete without a glass of supercharged greens, fresh pressed at the new juice bar housed within the Wolf & Badger boutique. Here he reveals five of his favourite local haunts. I love Etro for their men’s accessories, but moreover I adore the layout and design of this Bond Street store. Original 19th Century architectural features combine with some beautiful artwork and furniture from the Etro family to really set the shop apart. Slightly biased here, but Raw Press below the Wolf & Badger store on Dover Street is my absolute favourite place for breakfast. A ‘number 2’ green juice and some granola with coconut yoghurt always set me up well for the day. This gem of a store is a must-visit for jewellery lovers and history buffs. The owners have an amazing eye; the collection of vintage jewellery and objets d’art is second to none. 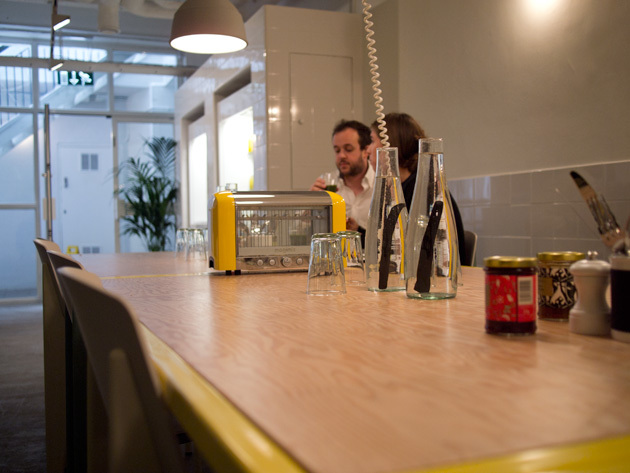 Don’t be put off by the burly security and pop in, even if just for inspiration. This tiny store in Burlington Arcade is packed full of luxury leather accessories. Friendly and personal service here is assured. One to bear in mind for Christmas gifts: last year I gratefully received some beautiful silk-lined leather gloves which saw me perfectly through winter. A Mayfair stalwart, Cecconi’s never fails to deliver. For a work lunch or dinner with friends this is always my go-to. Be sure to try their beef carpaccio, Venetian style of course. There are plenty of reasons to hanker after a bomber jacket this autumn. Firstly there are the contemporary shapes and luxe materials. Then there is the slightly retro vibe as demonstrated by a slew of designers from Dolce & Gabbana to Paul Smith. But gentlemen take note. 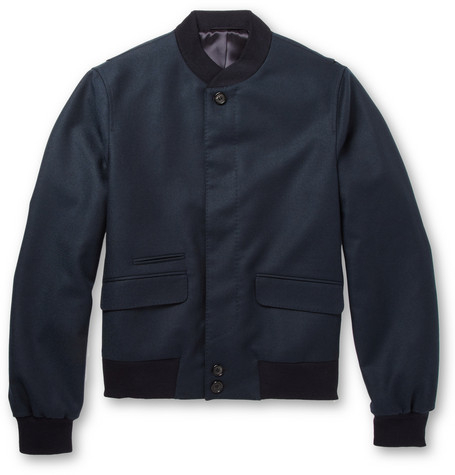 Since bomber jackets are also a hit with the ladies this season, this version in wool twill by Alexander McQueen (£725) could encourage stealth-like wardrobe raids from your other half. Best be on your guard! 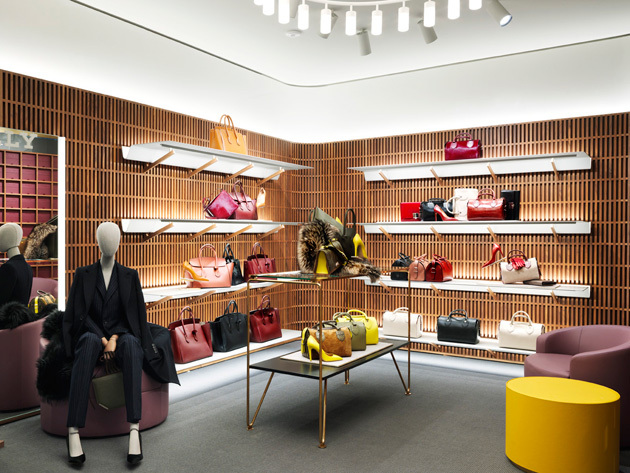 Bally, the luxury Swiss leather goods label has undergone quite a transformation of late. Having recently enlisted Argentine-born Pablo Coppola as its new creative director in 2013, last month (October) saw a new London flagship open on Bond Street – its first in decades. Just days after opening, I am ready for the grand tour, courtesy of Bally’s amiable store manager, Carl Strickland. His enthusiasm for British architect David Chipperfield’s shop-fit is clearly visible. No sooner am I in the door when he asks me step back out and follow him. Before I know it we are making a dash across Bond Street in order to stand on the other side of the street. From here, the view of the store’s elegant exterior is rather breathtaking. “Look up!” instructs Strickland, so I crane my neck back to look at the Victorian turret above the building. “There! See it?” he exclaims pointing to the flag sculpted from brass, which sits regally above. This is not your average flag of course. It could also be viewed as the finishing touch on the brand’s swish new image, which weaves its way up through three floors of retail space to a crescendo on the roof. Either way, this is classic Chipperfield and a taste of what’s inside this 4,320 square-foot space. Bally has a strong legacy of working with some of the most renowned architects. Previous collaborations include works with Robert Mallet-Stevens, Andrée Putman, Le Corbusier and Karl Moser. And who better than Chipperfield to translate Coppola’s contemporary vision across its floors and walls? For the store’s contemporary interior Chipperfield looked to the past for inspiration. This sprung from an archive photo showing a Bally store in Switzerland in the 1920’s. Designed by modernist architect and furniture designer Marcel Breuer, the store was teeming with stacked shoeboxes just as old shoe shops used to. 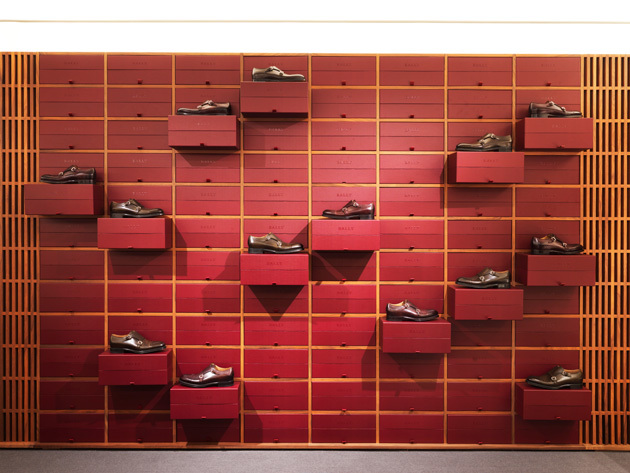 This old-fashioned feature is brought back in the new store, starting on the ground floor (womenswear) where dark red-coloured boxes line the maple wood walls. The LED lighting, which softly illuminates the shelves and mirrors between them, is impressive. But it’s the padded changing rooms that I especially like. Lined entirely with soft padded felt they have a cocoon-like quality and make me want to curl up and take a nap. After a quick zip around menswear, which is housed in the basement, Strickland leads me up the Italian marble staircase to the made-to-order department on first. Don’t be fooled by the ‘Gentleman’s Corner’ stand which greets you as you walk in. It might look like a slick cocktail bar but the brightly coloured liquids, which twinkle in little glass bottles, are toxic shoe dyes – not gin. The bespoke floor is exclusive to London, a place where customers are attended to by Aaron Lotey, the Gentleman’s Corner manager and expert shoemaker, who will help create the perfect shoe in any material or colour they desire. Before leaving, I spot a pair of brown leather Derbies made especially by Lotey for Chipperfield and signed on the sole by the architect himself. According to Strickland, Chipperfield made numerous visits to the store throughout the duration of the work. And when it was all finished he is reported to have sat in one of the rotund leather chairs and quietly surveyed the scene before passing comment on moving a specific fitting a millimetre here and lowering it a millimetre there. Speaking of precision, Strickland informs me that it takes around 200 stages to make a pair of Derbies from scratch. Something Bally’s eagle-eyed architect will no doubt appreciate.